My first thought is that someone made a replacement body. Looking at the edge bevels and the knob placement. What are your thoughts. 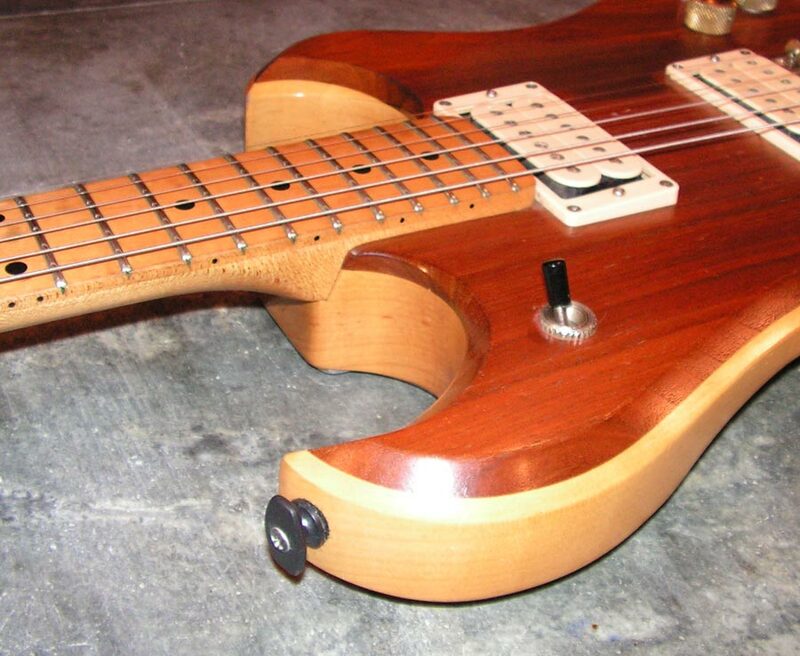 I dont believe SLM ever made any this color with a diferent top wood either. I may just have to buy this and check it out more closesly. Look to be a goog quality build if this is the case. It also apears to be an early 1981 model. Maybe a prototype??? I dunno, your thoughts? I magnified it and looked some more. 2 of the neck plate screws are replacements. 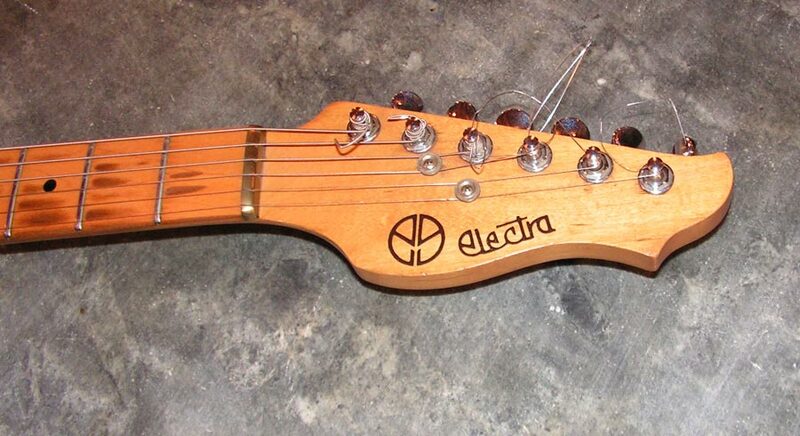 The tuners look like origional style, but no peace signs like on the head stock. 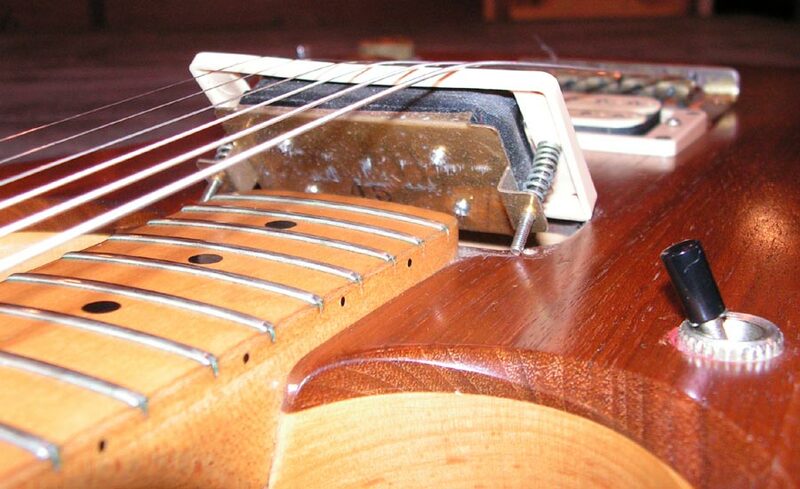 Tuners are chrome, but bridge and knobs are gold. 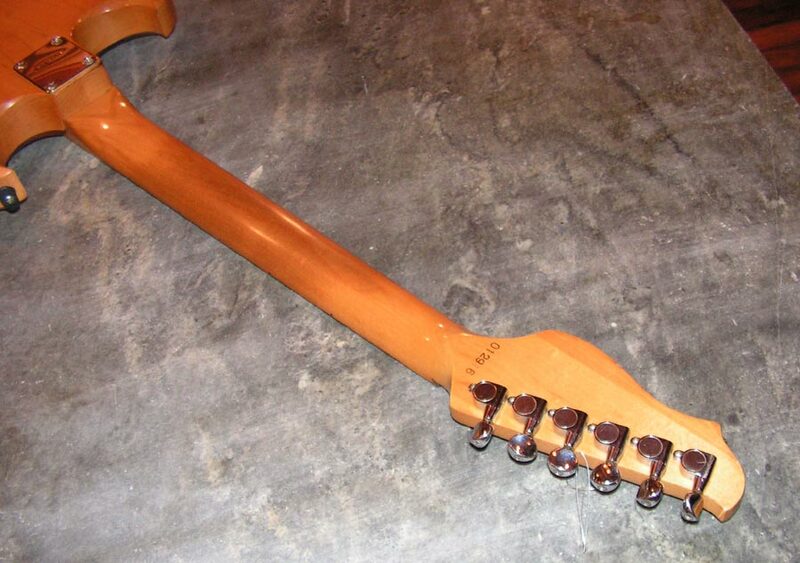 Neck has lots of fretboard wear. Still has origional brass nut. Im still thinking that this body is not factory built. Heck, Ive never seen an X100 series with cream pickups, rings and back plates either, come to think of it. How very odd!! It looks like a Phoenix, though; I mean, if the body is a home built, it has been shaped almost exactly like a Spectrum/Phoenix!! 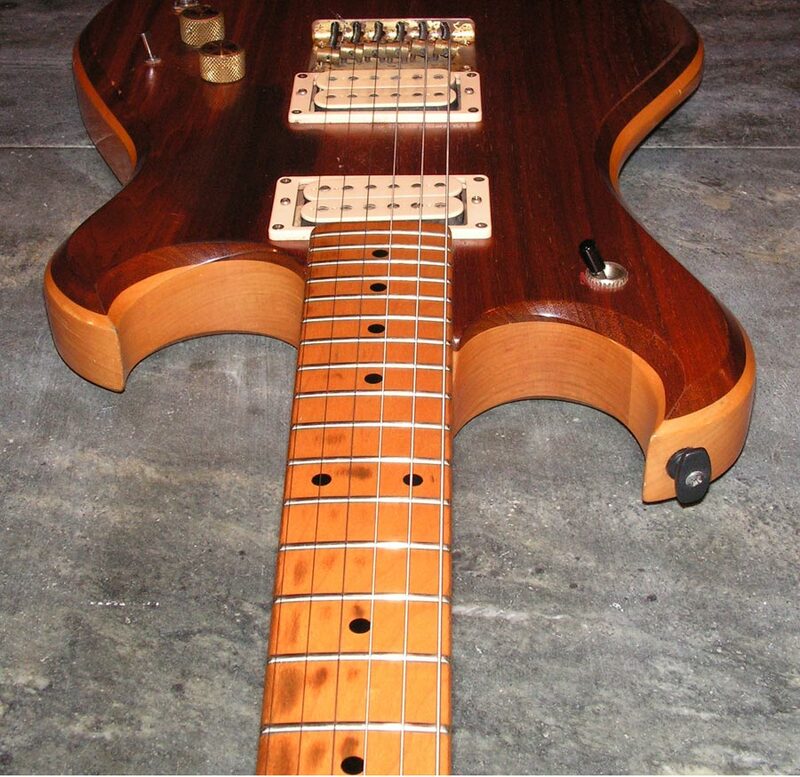 It looks to have a padauk, or similar, top over an ash or similar body and the thing to bear in mind is that MMK pickups did come in cream, so who knows?! We'll let X189 adjudicate on this one!! It's pretty cheap, too... Early s/n...?! "... and on the eighth day, God created New Zealanders. Because even the Australians need heroes." My phoenix has Chrome tuners with the brass bridge/knobs, it's not uncommon. The body is looks original, possibly modified? Also made in the second month of Phoenix production, according to neck serial. It is very cool. I hope to hear from X189 on this. 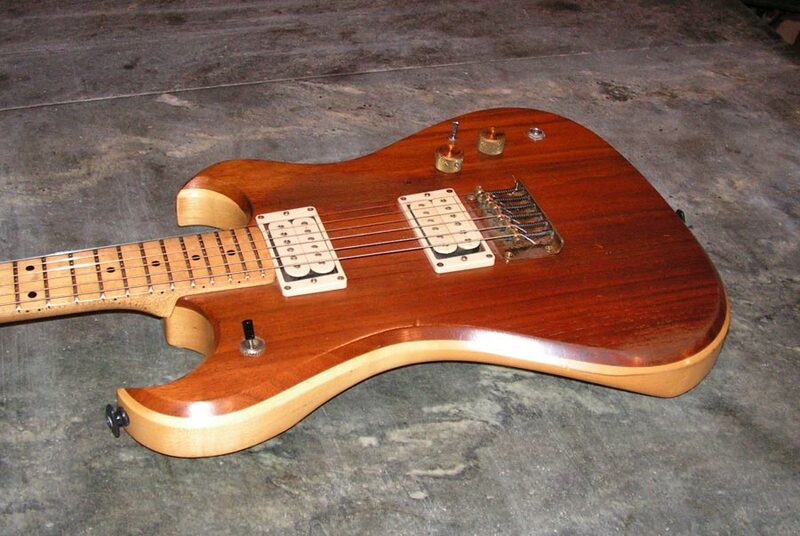 Seems really likely that someone took a normal X130, planed off the front of the body, and glued on a slab of mahogany, replacing the pickup covers and rings and making new back covers. I don't think the Six Digit Serial Numbers use the YMM prefix that the seven digits are known for. I'm no authority, but the six digits seem to be all over the place and I would not rely on them for year/month specifics. I know that there are three or four Forum Members down in Columbus, OH... somebody should go check this guy out in person! I didn't get much of anything done this week, except for this. I'll file a full report when it arrives. As for serial numbers, six and seven digit both seem completely consistent -- the first three digits always follow the YMM pattern. Then if that month they expected high production volumes, as in some months in 83 and 84, four trailing digits are added. For smaller volumes, only three. But I have yet to see an example where the first digit didn't match a reasonable year for the model, and the next two were 01 -12. Also, many serial numbers (including this example) show a slight jog or change in height after the first three digits, suggesting the first three were fixed in place and the next ones were a serial counter. 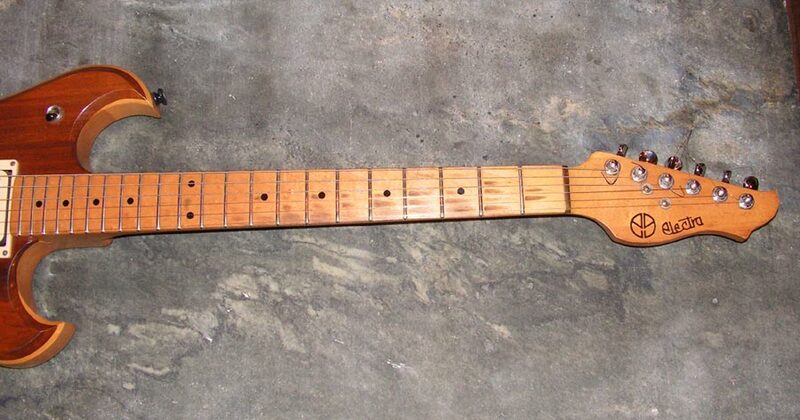 And some necks weren't stamped, especially from 84 on, I don't know why. I think export versions (many westones went to europe) had the serial on a neckplate instead, but a few have none. Thanks guys, I really appreciate the heads-up on this one. The more I look at it the more of a puzzle it is. I guess I love odd Electras. This one is pretty odd. I mean, it would have to be a complete refin, and it owuld be hard to do that without leaving traces behind (it's really hard to strip urethane). And what model would it be? 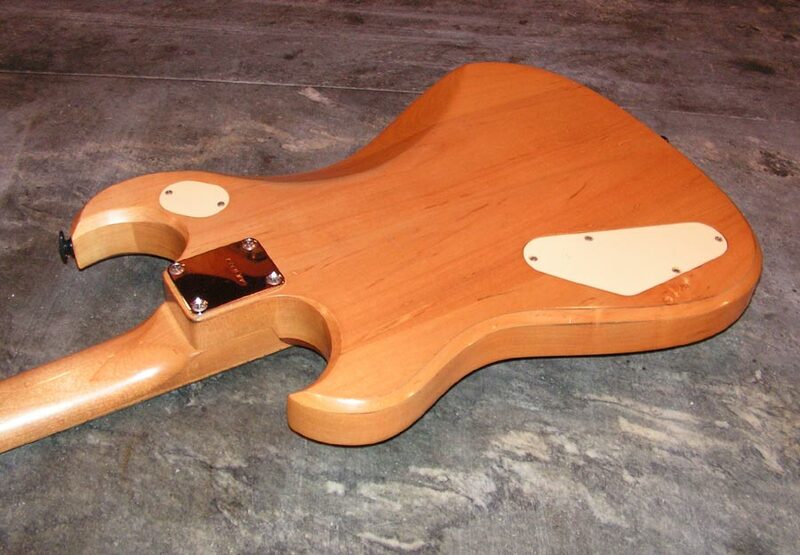 No maple bodied guitar was ever given a natural finish that I know of. The remaining detail is the pickups. Are they MMK45's? In cream white?? OK,maybe our friend ripped them out of his Endorser.. it could happen... 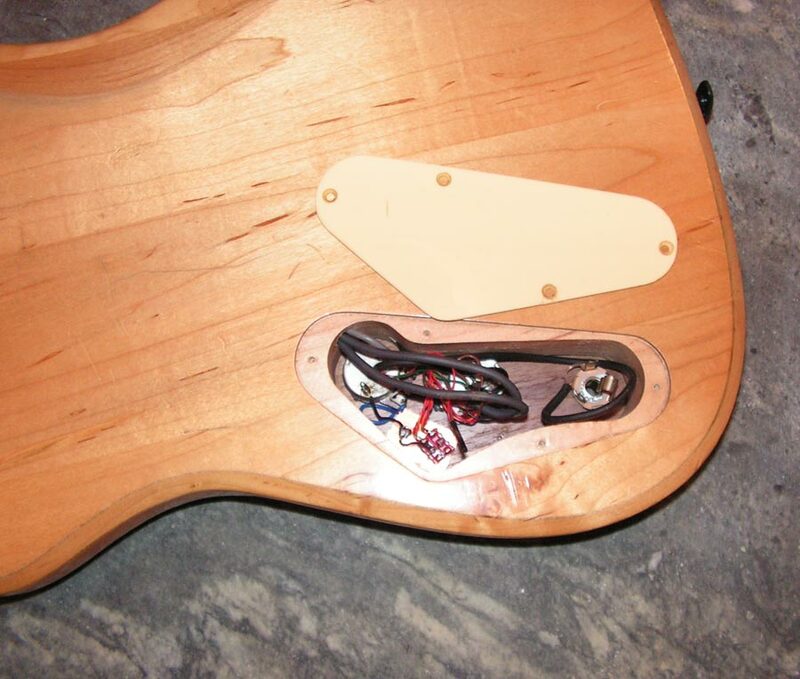 I'll sure be looking for resoldering marks in the control cavity, that will tell us our answer, right there. Way COOOOOL! Im glad you got it! I was hopimg that one would be in our happy little family here somewere. Thanks! It's nice when notable instruments come up that we can share the news and see that they get to a home where they'll not only be enjoyed, but documented and shared. If you see any other strange things like this, or early serail number Phoenixes, let me know and I'll see what I can do. Dang, it's original, it's amazing. Great neck, heavy wear by a good player, tone that kills. I've never seen anything like it. Natural finish maple. I'll pull the covers to be sure, but they look stock too. might be the best guitar I have, sheesh. there had better be some photos forthcoming, Paul - this looks a bit special!! MMK45's? Darn it! I knew I shouldnt have let that one go! Tell us more,,,,and must have pictures. I hardly know where to start with this one. The body is maple with a very thin clear finish (no maple phoenixes were clear!) and the top is mahogany. The edges are very characteristically bevelled. 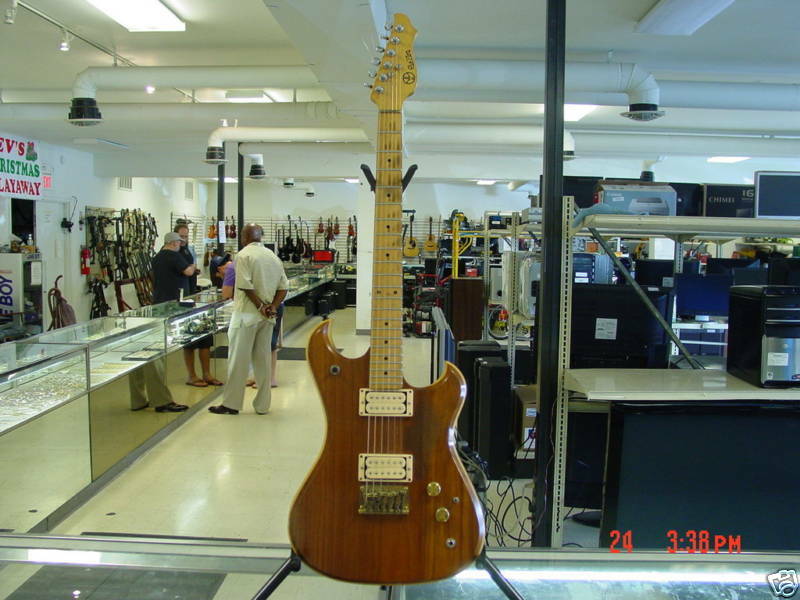 The body rout is essentially the same as an X149 or a later series X135, with the pickups mounted flush to a smooth front. Very different wood combination than either of those though. The electronics appear untouched. 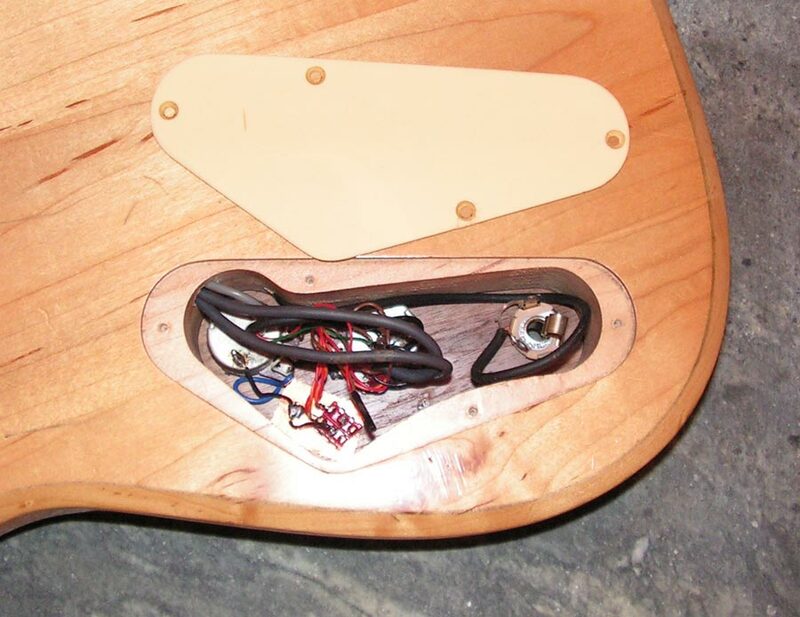 The neck pickup is an MMK45 and I'm sure the bridge is too. Note that the previous owner played it a LOT, and not just in the key of G.
I have to wonder the story of this. My guess is the factory threw it in unasked along with the first batch of Phoenixes, and said 'hey, check it out, you want us to do more like that?' and SLM said 'uh, no.' Or maybe somebody knew somebody and this was a custom request from the factory. But some good player played the heck out of this guitar, I'm thinking maybe a session player? 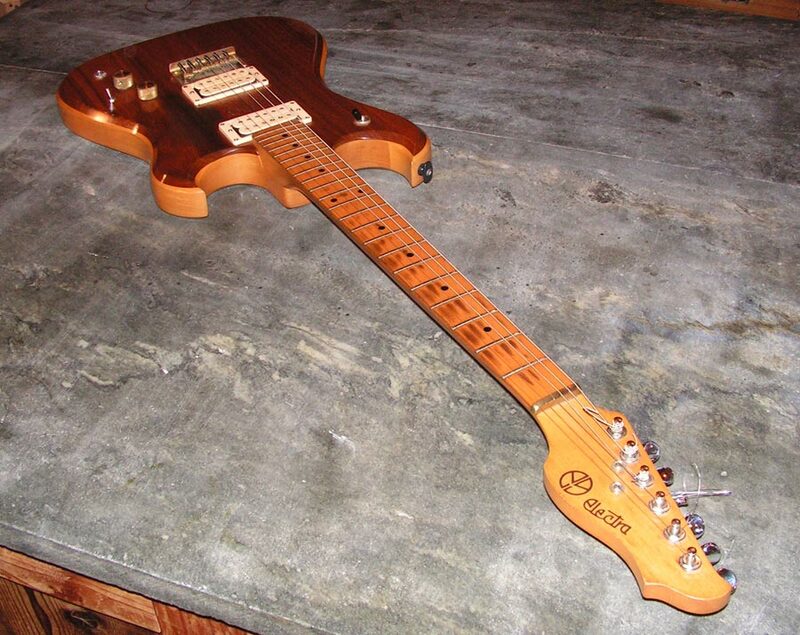 If anyone recognizes this guitar and knows the story, please let us know. Somehow it eventually wound up in a pwnshop in Columbus where i rescued it. Big thanks to RobotDr for spotting this. we had a gentleman's conversation about this before I swooped on it, I don't bid against my friends. So thanks RD for giving me this chance. It's got to be one of my most treasured guitars now.